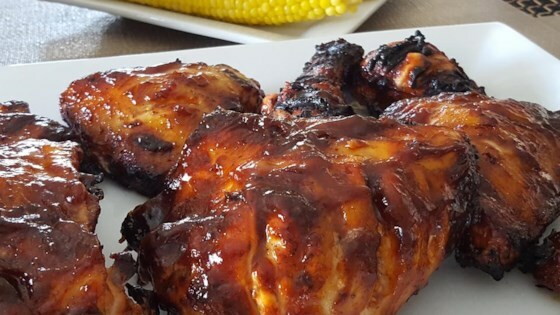 "When it comes to barbecued chicken, everyone wants that nice thick glaze of sauce attached to the skin, and the only way to do it, is brush it on as it cooks. Therein lies the problem. Because of the sugar content, it only takes a minute for a barbecue sauce to go from brick-red to solid black. I just 'mark' the chicken's vulnerable skin side, then cook it all the way through in a closed grill, brushing on the glaze as it cooks." Cut 1/2-inch deep slashes in the skin-side of each chicken half; 2 cuts in each breast, 2 in the thigh, and 1 on the leg; remove wing tips. Whisk rice vinegar, barbeque sauce, and garlic together in large bowl. Place chicken in bowl and turn to coat chicken in the marinade. Arrange chicken halves, cut-side down, in the bottom of the marinade bowl, cover the bowl with plastic wrap, and refrigerate for 1 hour. Remove chicken from bowl, pat chicken dry with paper towels, and discard marinade. Place chicken halves, skin-side up, on a plate and season with salt, pepper, paprika, onion powder, and cayenne pepper. Cook chicken, skin-side down, on the preheated grill for 3 to 4 minutes. Turn chicken over, close the lid of the grill, and cook, basting with remaining barbeque sauce ever 6 minutes, until no longer pink at the bone and the juices run clear, about 35 minutes. An instant-read thermometer inserted into the thickest part of the thigh, near the bone should read 165 degrees F (74 degrees C). This was the best BBQ chicken recipe I have ever had. My son who is not a big chicken fan raved about it and asked for seconds. I mixed the spices into the marinade. Turned out delicious.